Timeout for Art: Ancient Man’s Best Friend? (Ecuador) Allow me to introduce you to a new watercolor study, inspired by an artifact in the Bahia de Caraquez museum. I don’t think it reflects the emotion of contempt, but it seems happy and makes me smile. Several years ago I was allowed into the Museum’s special glassed room filled with artifacts. A guard accompanied me while I admired various pieces and was allowed to photograph a few. The director of the museum has given me permission to return to this room so that I can capture the likeness of artifacts that the public never gets to see. This precious artifact (above) is one of my favorites. It’s presently raining cats and dogs (but no artifacts) here at the Mirador Restaurant in Los Bancos, where I’ve enjoyed another great lunch, conversations with Patricio (His story is very interesting!) and I will head home as soon as there’s a break in the rain. Watercolor study – Suggestions for a name? So glad you are finding time to paint! He does seem to be a happy little fellow and you have captured that wonderfully 🙂 Safe travels slogging back! dear dear pat! you are so sweet to take time to comment/give your support when you’re there on the front line and wondering when superman is going to round up those capable of turning this crisis around. thanks, amimga. should see you next week sometime…. That dog has a very sweet face…it makes me smile, too! dear cindy, i think it must be an easy task to make you smile, though i’m glad that the painting and artifact convey that emotion to you as well! thanks, amiga. it will be great to return to the museum for more seriuos studies.. there’s another in progress here in mindo, and it’s going well.. the artifact has a ‘crown of birds’ – incredible! Wow.. that crown of birds sounds amazing! Cats perhaps. Not dogs. Steinbeck is confusing the two! ha… it also depends on the animals, but yes, cats can be quite snobbish, can’t they? we had a cat once that a friend said it must think it’s a dog.. it tagged along everywhere we walked, even way back in the cotton fields of the mississippi delta! Our cat thinks we are his servants and the place is his. As usual, this is a super post. Please keep up your good work. Of what is that little museum piece constructed? Guess what, Lisa? I am recovering from dengue! I went to the sweet village of Kino where I spend a lot of time and got a welcome back kiss from a mosquito. Five days later, I was the latest in the dengue count. Although no one in Kino usually wants even a light freeze, this year I think most folks would love to see one. So many are getting sick. this past time i craved coconut water and still gulp down as much as i can whenever the option is there…. get lots of rest and don’t try to bounce back too fast..
Awww…love the little fellow. Lisa, I read yesterday that they declared a state of emergency in Ecuador in preparation for strong rains because of El Niño. I hope it is just a precaution. Keep us up-to-date on what is happening in your neck of the woods. good to hear from you again, I have missed your posts. The dog is wonderful. He reminds me of the famous Blue Dog, of Georges Rodrigue. Did I mention him to you? I told someone about him very recently — in any event, the resemblance is uncanny. I do love seeing your process. It’s a glimpse into your studio, from all these miles away! you are so right, and yes, i love that whimsical blue dog series! am on the road, and it’s raining hard.. stopped for a late lunch… more the next few evenings. I think the artifact looks more like a she! Yes, the artifact’s attentive ears do remind some of us of a very special mascota! That was a fun progression. You make it look so easy. Little doggy looks happy to have been brought to life. 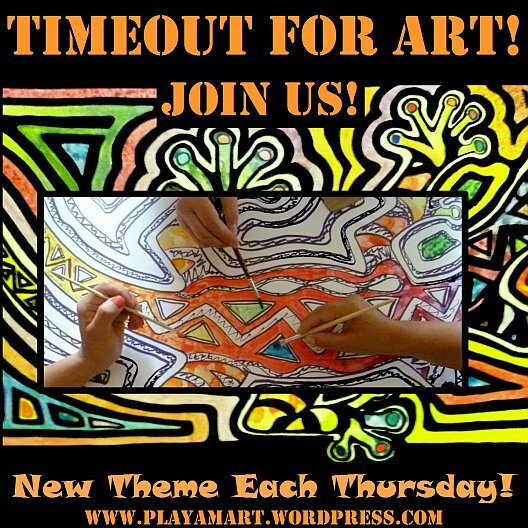 Timeout for Nature - and for Art!